Perseid Meteor photographed from Rose Hill Cemetery west of Lamoni, Iowa. 4:55 am CDT, August 13, 2018. Cropped from the original image. Tonight (Dec 13-14) is the night of the Geminid Meteor Shower. This article will tell you what you need to know to photograph what should be the best meteor shower of 2018. Get as far away as you can from big city lights. Put your camera on a tripod. Use a wide angle lens to take in a wide area of sky. Manually focus the lens on infinity. That can be tricky for night photography. Read this article for help. Start with these settings: ISO 3200. Aperture of f/4. Shutter set at 30 seconds. Take a few test pictures , even if you don’t see any meteors, to test your exposure settings. If the meteors, the stars (or the sky background) are too bright, try ISO 1600 or lower (or cut the shutter speed from 30 to 15 seconds). If the meteors/stars are too dim, try ISO 6400 or higher. Where do you point your camera? Tonight is the Geminid meteor shower which means the meteors appear to radiate from the constellation Gemini. If you have Stellarium for your computer, the Planets app for your smartphone (or a similar night sky app), or a planisphere, or start charts, figure out where Gemini is in the sky and point your camera generally in that direction. If you don’t have a tool to tell you where Gemini is, tonight Gemini will move across the sky from high in the east (around 10 pm) to nearly overhead in the middle of the night, to high in the west before dawn (6 am). The shower should get better throughout the night and be at its best in the hours before dawn. Expect to see a meteor on the average of once every 1 to 2 minutes. Don’t wait to see a meteor before you open the shutter. Just take one picture right after another until you get something. Check your exposure, adjust the ISO if necessary, and do it again. If it is cloudy tonight where you live and it will be clear tomorrow night, try again tomorrow night (Dec 14-15) between 11 pm and 6 am local time. You might catch an occasional straggler. 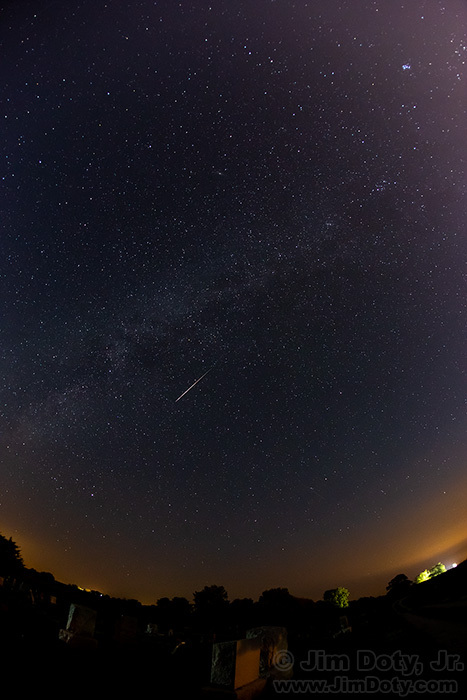 A wide angle lens increases your odds of photographing a meteor. 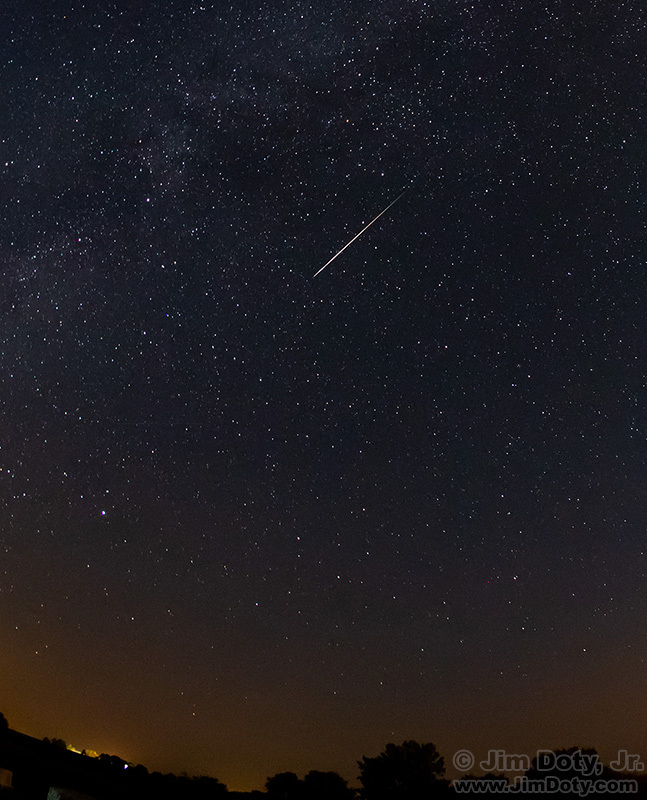 Although meteors appear to radiate from a specific area of the sky, they can show up anywhere in the sky. A wide angle lens does mean the streak of the meteor across the sky will look smaller, but you can always crop the original image, as I did for the image at the top of this article. This is the uncropped image. Photo Data: Canon 5D Mark III. Canon EF 15mm lens. f/4.5, 30 seconds, ISO 3200. How To Use a Planisphere – with additional information on Stellarium software for your computer and the Planets app for smartphones. This entry was posted in General, Photographs, Techniques, Using Equipment by Jim. Bookmark the permalink.